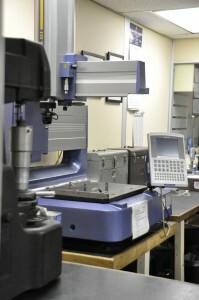 The quality control philosophy at Division Stampings is process based. We understand that a quality stamping does not show up at the end of the line without quality controls along each step of the process. That’s why our exacting quality control department inspects your parts at each phase of production, from print to finished part. Material Certifications, Inspection Reports, SPC Charts, and Certificates of Compliance can be provided with every shipment per customer instruction. Since 2010, Division Stampings has integrated the quality standards of ISO 9001:2008.